Hi neighbours, hundreds of people expected Auckland Transport to be at the St Heliers and Glendowie residents' association meeting. Many locals are upset at the road safety proposal. However, Auckland Transport's chief executive said it would not speak, citing a "hostile" group. What are your thoughts on the situation? Should AT have gone to the meeting? Please add NP if you do not wish for your comment to be in print. Do you support the proposed changes to Auckland's dog rules? Hi neighbours, dog owners are upset over potential park and beach bans that have been proposed for Auckland Council's pooch policy. The update would ban dogs from beaches and parks from Labour weekend to March 31 during busy hours, and extend the current ban from 10am - 5pm to 10am - 7pm. What are your thoughts on this proposal? Please add NP if you do not wish for your comment to be in print. 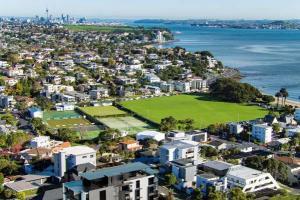 Did you know the St Kentigern's Remuera property has been sold? Hi neighbours, private school St Kentigern has sold its Remuera property, valued at $23 million, to the Auckland Hebrew Congregation. The buildings covering 1.24 hectares, included classrooms, a two-level villa, a large swimming pool and a tennis court. What are your thoughts on the land being sold? Please add NP if you do not wish for your comment to be in print. Does Auckland need another elephant? Hi neighbours! In 2017, an Auckland Council committee put aside $1.6 million for an elephant called Nandi to move to New Zealand. Two years later, she is nowhere to be seen. A councillor says the city does not need another elephant and the money should go into other projects. What do you think? Please add NP if you do not wish for your comment to be in print.